This article will demonstrate some simple soft tissue release techniques you can do yourself, along with focused stretches for commonly tight musculature. Common postural traits are evident in virtually every gym and massage therapy clinic worldwide. This faulty posture, known as upper and lower cross syndrome, can affect strength, stability performance and negatively impact on our ability to incorporate ideal form during key movement patterns. I’ll also share some simple but hugely effective gluteal and scapula retractor activation exercises Foam rolling and Active Isolated Stretching (AIS) are my personal techniques of choice. No fancy equipment is needed and both techniques are relatively easy to incorporate into your warm-up or to do on rest days in front of your television. 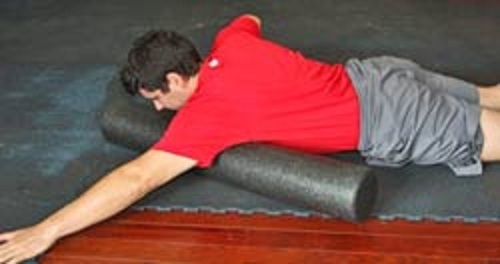 Foam rolling is a great soft tissue release techniques to reduce muscle density and deactivate troublesome trigger points that cause muscle shortening and diminish strength and cause pain. The soft tissue release techniques I suggest is to foam roll and stretch so that you get the most bang for your buck when it comes to lengthening common tight muscles. I have tried to include straightforward techniques that don’t require awkward body positioning and time consuming set-ups. The entire soft tissue release foam rolling, AIS stretching and activation routine should take approximately 20 minutes. To perform the soft tissue release stretch, lying on your side grasp the front of the opposite foot. Tense your glutes and hamstrings, and pull gently on your foot to elicit a stretch in the anterior thigh. The TFL a really tricky muscle to stretch by yourself, so here is a soft tissue release technique I personally developed to open up the anterior hip (called the PC stretch). The key to stretching the TFL in this position is the initial set up. Notice how the rear leg (the leg being stretched) is adducted and externally rotated. You then lunge forward trying to keep the hips square. Ensure that you tense the glute max on the rear leg to initiate the lunge motion. 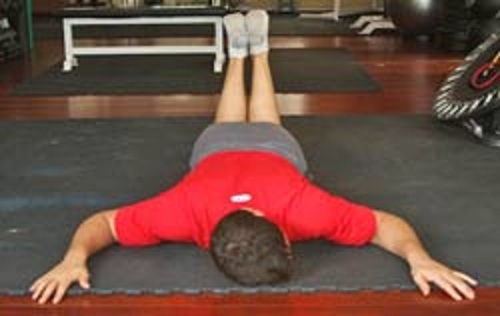 For the soft tissue release stretch, lie on your back with the knee fully extended. Use a rope around the foot to help produce a stretch and to create internal rotation, or in simple terms, toes turned inward. Use your quadriceps and hip flexors during the movement. Aim to lift the leg so your foot is approximately 8-12 inches away from your shoulder. This stretch is has emphasis on the upper region of the long adductor group. For the stretch, using a gym ball or plyo box, place the elbow so it is positioned just higher than the torso. Drop your chest down and back slightly whilst simultaneously tensing the posterior deltoid and scapula retractors to increase the stretch on the pectorals. I prefer to perform latissimus stretches in a standing split stance. I feel that this helps to lengthen the lower part of this muscle in and around the thoracalumbar fascia area and it’s a great way of getting an extra little quadratus lumborum stretch. Start rolling the calves from the mid calf to just below the knee. 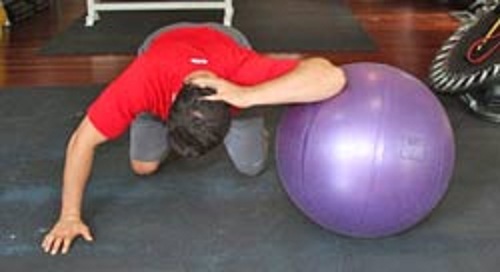 You will need to roll the outer and medial head to ensure maximal release. To affect the soleus you will need to apply more pressure as this muscle is very broad and flat (again ensure that you cover the lateral and medial borders). Place the foam roll or tennis ball at thoracic vertebrae 12, approximately just below were a bra would be (if you wear one!). Extend over the roller or tennis balls using a mini crunch type movement. Perform 2-3 mini crunches at each segmental level, and then move down slightly (approximately 1 inch). 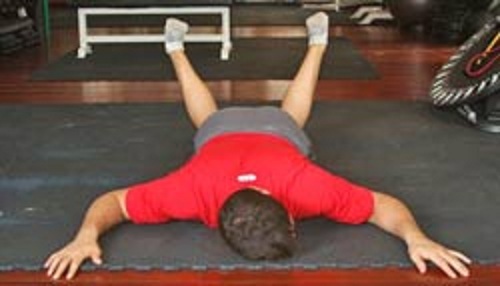 Repeat this soft tissue release techniques until you reach the top of the thoracic spine, around the top of the shoulder blades. 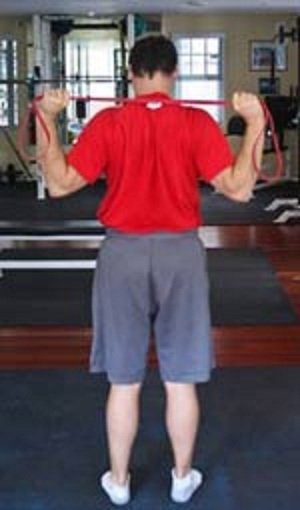 Band pull aparts is a simple soft tissue release exercise that increases muscular recruitment of the mid and lower traps and the scapula retractors. 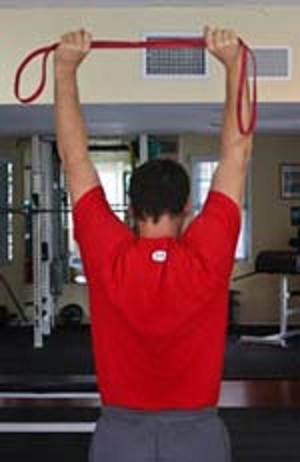 Holding a band at shoulder width, begin the pull down movement whilst pulling your hands apart to activate to required areas. This exercise has numerous athletic enhancement qualities. Our intention with this soft tissue release exercise is to activate the gluteus maximus and shoulder stabilizers. If you have to postural traits of upper and/or lower crossed syndrome, then add this short soft tissue release techniques proutine into your existing warm up, recovery or rest day sessions. 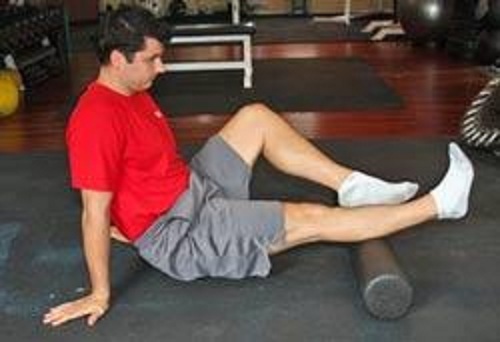 So there you have several basic self-help soft tissue release techniques incorporating foam rolling, active isolated stretching and muscle activation exercises. This simple routine will help prevent injuries and minimize current muscular aches and pain. Invest just 20 bucks in equipment and 20 or so minutes of your time several times a week to help maximize energize yourself and your training.